Move seats on the ground while falling at 125mph? Why not? When it comes to the guru of action and adventure, Bear Grylls, there's very little left that he can do that would shock, right? Wrong. 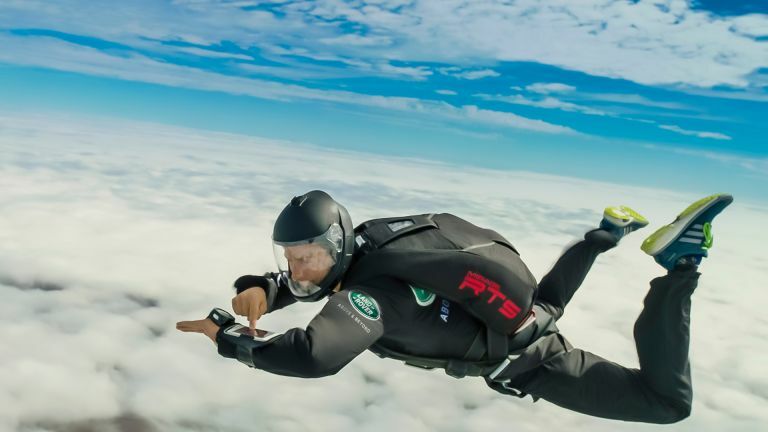 He just jumped out of a plane while controlling the new Land Rover Discovery seating on the ground as he was free falling. Spoiler alert: he managed to arrange the seating as he wanted and didn't die. So breathe easy and read on. The stunt was to show that the app which works with the new Land Rover Discovery, due to be fully revealed on 28 September, is able to control the smart electric seating from afar. The app, in a claimed world first, lets the user actually move seats up and down - ideal if you want the back flat to load up that bed you've been lugging around Ikea. Or in this case for Bear to have the seats all up ready for him to collapse into after the skydive. The new Land Rover Discovery is the first major redesign to the car in over twelve years. It sees some serious tech upgrades in a car that can handle any terrain it, ahem, discovers. The accompanying app can access the Intelligent Seat Fold system from anywhere in the world. It can control all seven of the car's seats, meaning they will robotically move to become flat should you need them that way. Bear Grylls jumped out of a plane with six Royal Navy Parachute Display Team members and hit speeds of up to 125mph with his phone strapped to his arm. He was then able to use the InControl Remote app to tell the car to move the seats which reconfigured in a meagre 14-seconds. Talking about the free fall Bear pointed out: “I told the guys before we jumped that if I had time I'd stick the heated seats on too.” While this isn't an option from the app yet it looks like Bear is onto a great idea for a future software update there. The new Land Rover Discovery will be unveiled fully on 28 September where we'll be ready to bring you all the details.